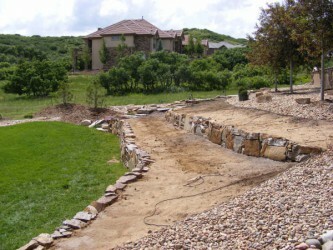 Building retaining wall is necessary if you live in sloped area. 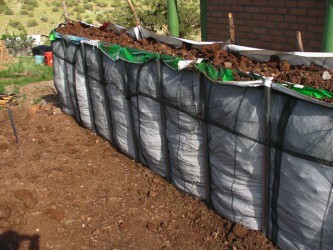 It is an effective way to prevent soil erosion, and it can be a decorative feature. Some homeowners, however, might hold back this idea since they think the budget will be expensive. This will not happen if you can repurpose some old materials that already on hand, you can cut cost of the material purchase. 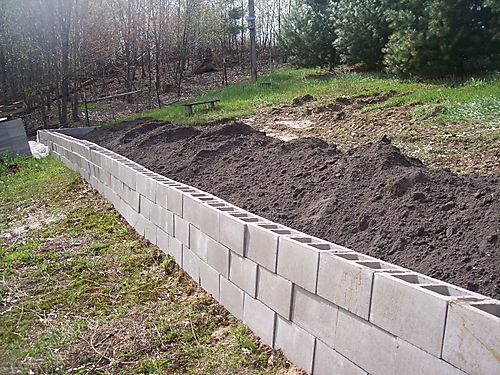 These are the solutions for building inexpensive retaining walls in your garden. 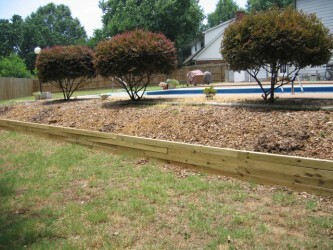 By means of landscaping timbers, you can build cheap retaining walls. Wood is a natural material that adds warmth and texture. However, untreated timbers may crack, and most types will become discoloured over time. 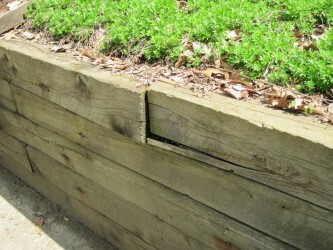 While landscape timbers have the shortest lifespan if compared to other retaining wall materials, such stone or concrete, a wood retaining wall is still durable, typically lasting 10 to 20 years. 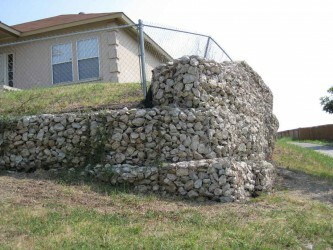 Dry-stack rock retaining walls are inexpensive because you can use rocks already in your landscape, or find them at quarries or construction sites at a lower cost than commercially available natural stones. 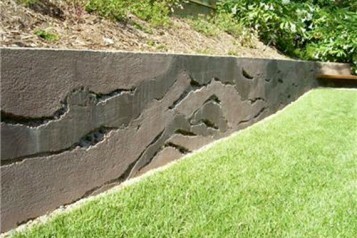 This type of wall is ideal when you need a retaining wall that is less than 4 feet tall. You cannot use it, however, for walls exceeding 4 feet in height. Ensure your wall is at least half as wide as it is tall. For example, a 2-foot wall should be at least 1 foot wide. 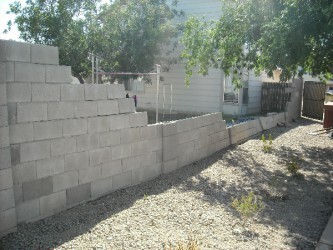 When constructing the wall, use wide rocks that fit together tightly, and place your larger rocks on the bottom. Slope the wall inward about 1 to 2 inches per foot of height to prevent the rocks from toppling over. Constructed of wire, wood and rocks, gabion walls were originally used as a cover wall on military front lines because they are easily taken down and moved, and they can be filled with rocks or other materials at a new location. 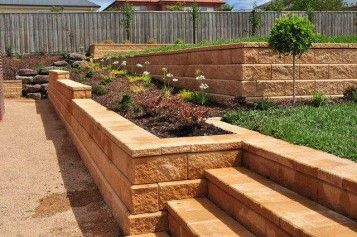 Their industrial appearance and clean lines make them ideal as a retaining wall in a modern landscape. 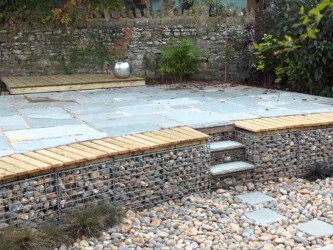 To make a gabion wall, construct a wire mesh box with a sturdy wood frame and fill it with rocks, coloured stones or rock and cement from a local blast site. 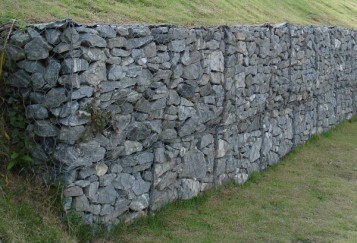 Gabion walls can be made in one long, continuous wall, or as small containers, you can stack in sections. If you add wood planks on the top, you can create a retaining wall that is also a garden bench or a platform for container plants. 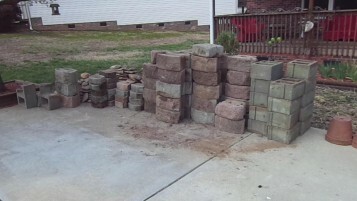 The cheapest way to build a retaining wall for your garden is to look for materials you can repurpose at no cost. 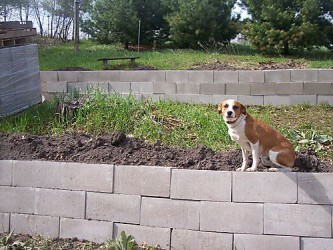 For example, if you have old tires hanging around, these can be used to make a long-lasting garden retaining wall. They are not usually visually appealing on their own, but if you plant trailing groundcover plants behind the tires, the foliage will grow over the sides, adding texture to your garden while hiding the tires. When constructing a wall with tires, fasten them with metal posts or wire and fill each tire with gravel. You can also recycle broken concrete, timber from old structures, such as decks or sheds, or damaged bricks into an attractive garden wall. 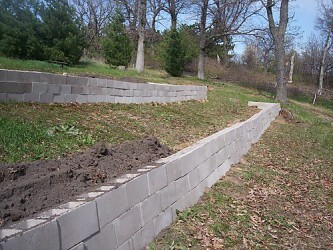 The key success of building inexpensive retaining wall in your garden is think out of the box. Sometimes old material and repurposing may create a more striking building than the ones made of commercial materials.